The short film was made to call attention to World Refugee Day and — not incidentally — how the plight of refugees and humanity’s terrible track record in responding to them has been going on for at least 600 years, if not longer. It’s a powerful speech (whether rendered by a group of high school students or Sir Ian McKellen) that simultaneously pleads the case for strangers (immigrants) and against the “mountainish inhumanity” that would demonize and expel them. It’s also a political speech, taking a stand on a national issue even in a historical and fictional context, and in its way a patriotic act. Is it patriotic to criticize one’s government, or must we celebrate our country blindly? We don’t think of Shakespeare as being political; we think of him keeping his head down and writing his plays, being extremely careful to not run afoul of the Master of the Revels, who had the power to censor or shut down plays that could be too provocative. Shakespeare would never have dreamed of criticizing Queen Elizabeth or any of the officials in her government; in addition to being a bad idea it was also illegal. But neither did he write patriotic pablum designed to flatter his monarch. He wrote probing works that explored recognizable human behavior, which, in its way, particularly in a politically contentious time that rumbled with a strong puritan disapproval of theatre and play-acting, was a powerfully political act. As Isaac Butler points out in “Lend Me Your Ears,” his podcast focusing on Shakespeare and politics, four of Shakespeare’s first seven plays (Henry VI, Parts 1, 2, & 3, and Richard III) concerned the Wars of the Roses, the series of 15th-century civil wars fought for control of the English throne. All this early focus on the dangers of political chaos suggests it was an important theme to Shakespeare — and presumably his audience — especially given that Elizabeth was an aging queen without an heir or designated successor. The four plays boldly suggest — if they don’t state outright — that the chaos and violence following the death of Henry V was something that should not be repeated. 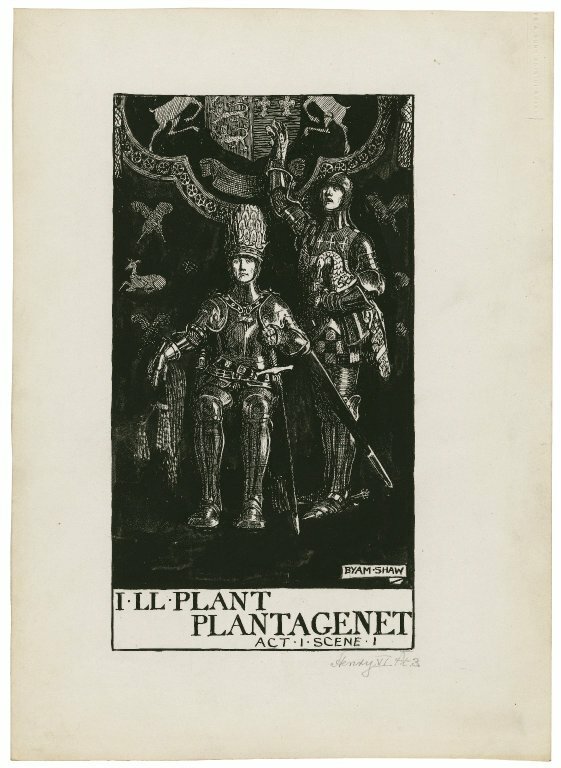 King Henry VI, part 3, a set of seven original drawings by Byam Shaw. ca. 1900. Folger Shakespeare Library. Speaking of whom, Henry V, written roughly eight years after his Wars of the Roses plays, is the relatively straightforward (for a History play) tale of Henry’s re-acquisition of northern France which culminated in the Battle of Agincourt. It portrays a strong and decisive military leader who plots a course of action and then follows it, despite whatever concerns he may express about war’s human cost and an epilogue that reveals that all that had been gained was subsequently lost. Because of this wonderful ambiguity, Henry V can be interpreted in many ways, whether as a rallying cry, like Laurence Olivier’s 1944 film, intended to be a morale booster for a nation five years deep into World War II, or a meditation on the cost of war, like Kenneth Branagh’s 1989 film version. Both films — like the play itself — can be seen as patriotic, examining issues of national interest through a prism of jingoism or cautious national pride. 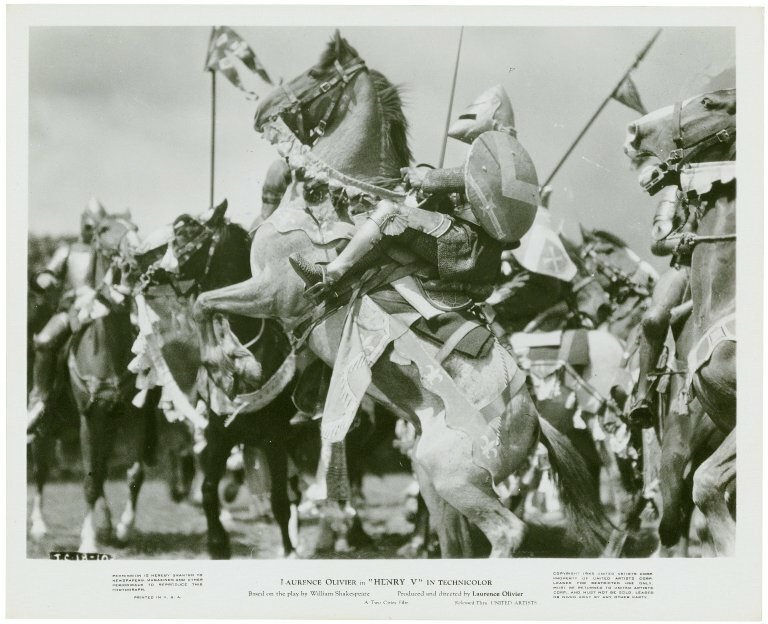 Photograph from Laurence Olivier’s movie of Henry V: French Knights. 1945. This call to imagine, to put yourself into another person’s shoes, to invite audiences to be willingly transported to different countries and different eras while remaining within the boundaries of a playhouse — this celebration, in other words, of theatre’s power — is a significant theme throughout all of Shakespeare’s plays. The practice of empathy is at the heart of what happens in the theatre, both onstage and in the audience, and at the heart of how Shakespeare managed to navigate his sharply divided political era. Perhaps it also illustrates how we might navigate ours. Austin Tichenor is the artistic director of the Reduced Shakespeare Company and the co-author of Pop-Up Shakespeare (illustrated by Jennie Maizels) and the irreverent reference book Reduced Shakespeare: The Complete Guide for the Attention-Impaired (abridged).